Proper medical device sterilization is critical to patient care, and ethylene oxide is critical in medical device sterilization. Ethylene oxide is known as the most universal sterilant because it can be used for sterilization of almost all medical devices including plastic and heat sensitive materials. The same cannot be said for other technologies, such as heat sterilization, radiation or peroxide. Ethylene oxide is used to sterilize items that are essential for saving lives – including fiber optic endoscopes, surgical telescopes, ophthalmic instruments, speculas, syringes, anesthesia masks, catheters, respirators, inhalation supplies, and even surgical gowns, staplers, staples, and sutures. Please click here for more information on the benefits of ethylene oxide sterilization. EOSA's position statement outlines serious flaws with the EPA's Integrated Risk Information System (IRIS) assessment of ethylene oxide, and recently published federal reports. The 2019 Ethylene Oxide Sterilization Technical Conference will take place on September 23 - 27, 2019, in Park City, Utah. 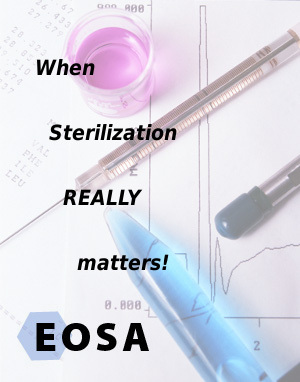 The EOSA invites you to learn more about ethylene oxide and its use in sterilization. We hope this website provides the information you are looking for. If you are not already a member, we encourage you to review our Membership page for further details, and consider joining EOSA in order to access the high-quality content in our Members Only section. Members - please Login and look around - and send any comments or suggestions to eosainfo@eosa.org.